Sensational sunsets, expansive deserts and wide-open plains; imposing mountain ranges, lush forests and gargantuan caverns; historic cities and a reputation for the extraterrestrial: welcome to New Mexico. Nicknamed “the land of enchantment,” the state somehow manages to live up to that lofty billing with its spectacular topography and fascinating heritage. The Pueblo and Navajo Native American cultures are very much alive and well here, and a strong Hispanic lineage also helps determine its distinctive character. New Mexico’s historic national parks include the equally overwhelming and enchanting Carlsbad Caverns (where you can watch Mexican free-tailed bats emerge at sunset), the beguiling beauty of White Sands, the awe-inspiring sight of Shiprock mountain in Navajo country, and the striking cliff dwellings and Pueblo settlements of Bandelier National Monument. The state’s largest city, Albuquerque, is a colourful metropolis made famous by the hit television series, Breaking Bad. A hip city with a vibrant arts and music scene, the city’s charming Old Town and bountiful cultural attractions, coupled with its attractive setting on the Rio Grande, make it a popular destination. Santa Fe, with its earthy adobe architecture, is the USA’s oldest state capital, known for its sophisticated artistic community. 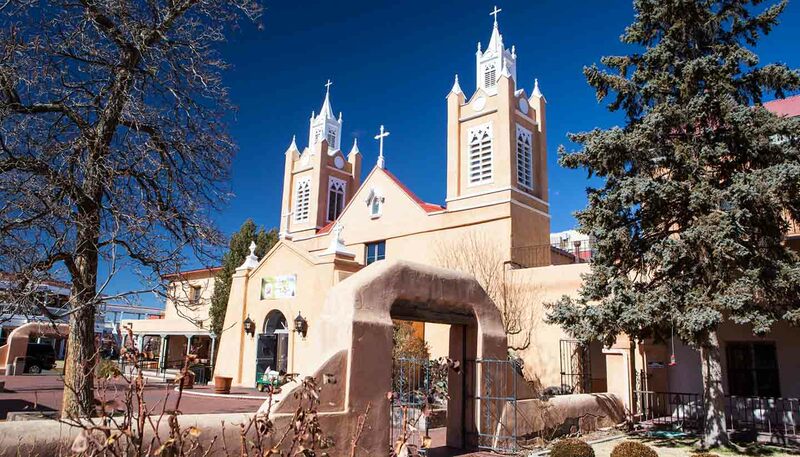 You can catch a glimpse of the oldest church in the country, procure local art and Navajo weavings at Indian markets, or merely take in the city’s pleasant ambiance. In the southeastern quarter of the state lies Roswell, a relatively unexceptional city until 1947 when a UFO reportedly crashed nearby. To this day visitors flock to this corner of New Mexico to imbibe the extraterrestrial ambiance and walk around a museum dedicated to the infamous incident. 314,914 sq km (121,589 sq miles).